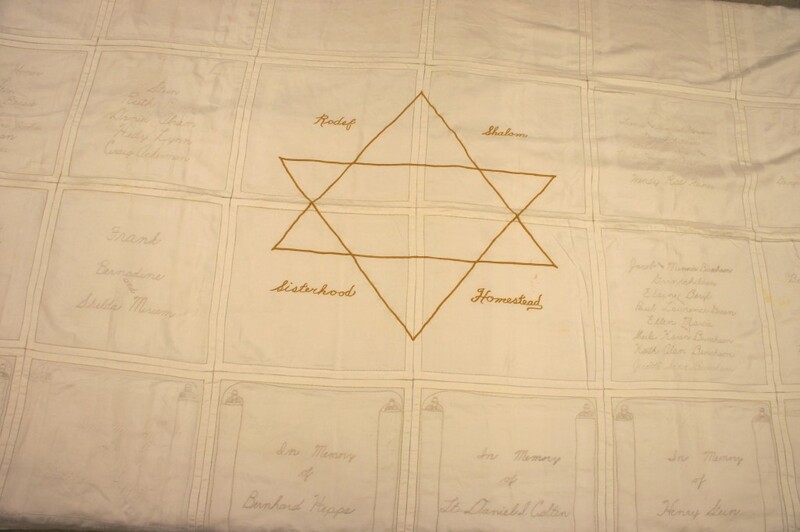 At the time the synagogue’s papers were donated to the Rauh Jewish Archives, a few objects were donated to the Heinz History Center’s physical collections as well. One in particular stood out to me — a tablecloth?! 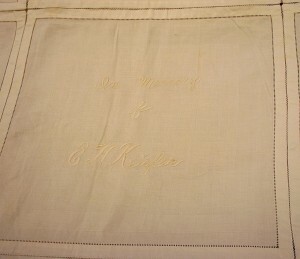 The record described it as a, “Large, rectangular white cloth composed of 48 napkins stitched together. Most napkins have embroidered names of family members of the Rodef Shalom Homestead Sisterhood–which is stitched in gold thread around a star of David in center of cloth. Lightly starched. 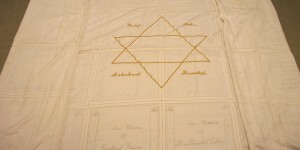 Sewn by the Sisterhood of Rodef Shalom Congregation in Homestead.” Well, that sure sounded intriguing! 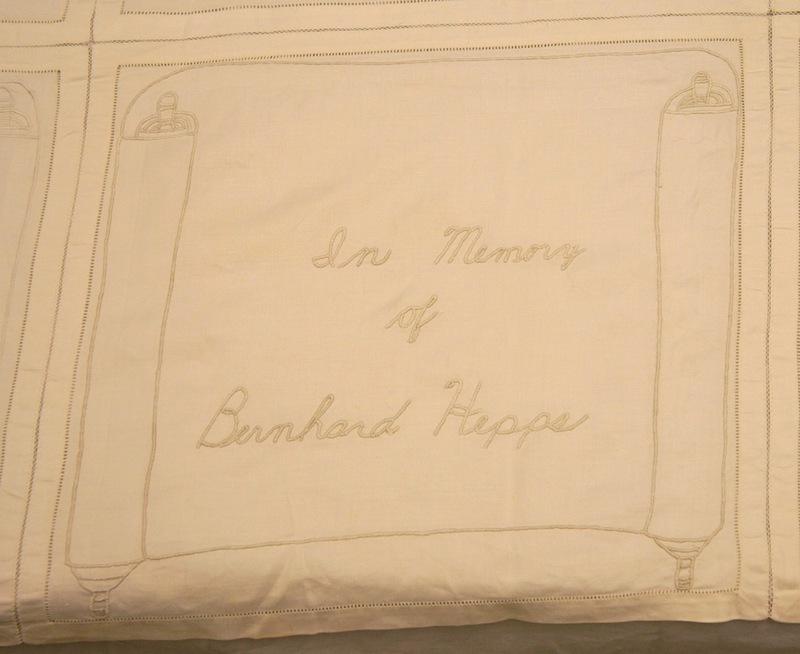 And indeed, waiting for me in the museum’s collections room at the time of my appointment was… a giant tablecloth! 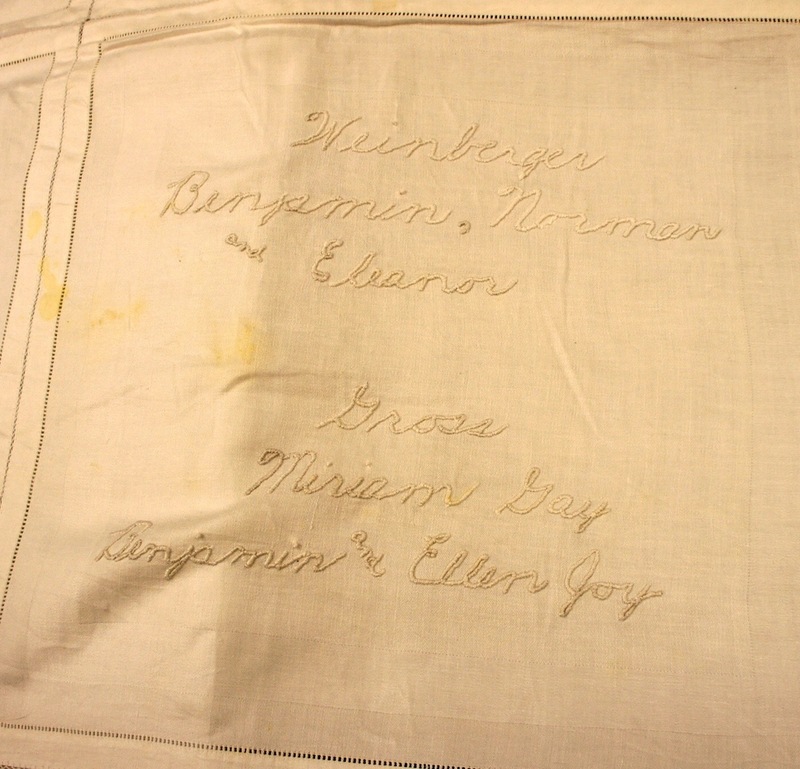 Mrs Harry Weinberger gave her tablecloth report and had the napkins to show and when it is finished it will be something beautiful + something that will be cherished by our women….A motion made by Mrs Harry Weinberger + seconded by Mrs E.A. 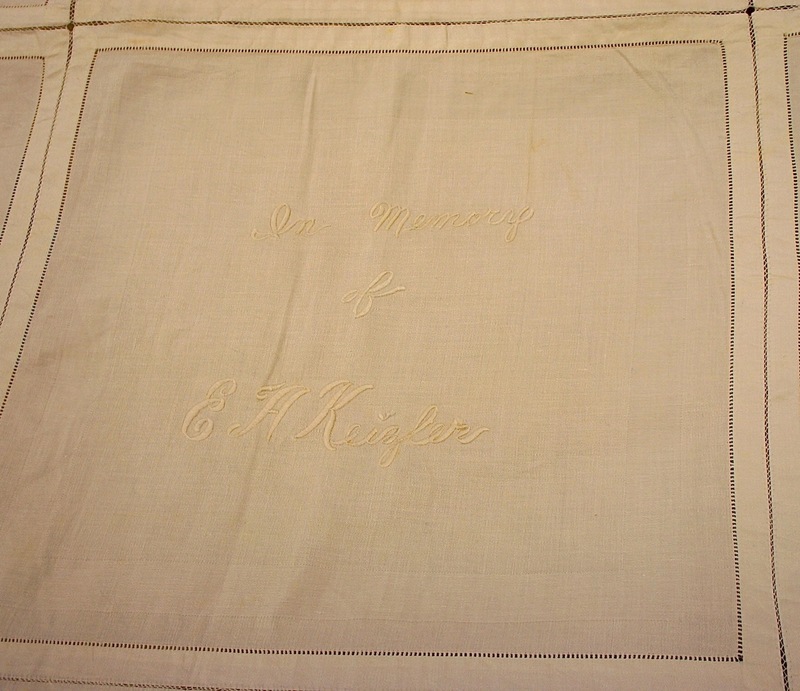 Keizler that we pay $56.56 for the napkins to be used in the tablecloth making. And yet, by the following month $776.44 (!) had already been raised to fund it (and no, that was not the profit from the party). Something was going on that the minutes unfortunately do not capture. The square for my great-grandfather. His square — and all the square shown above with a border — have a scroll like this one. The tablecloth I saw has 44 napkins, of which 27 are embroidered. 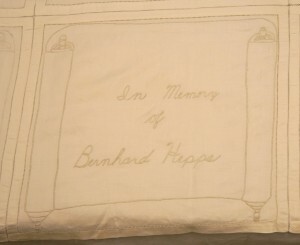 I have to assume it was not completed all at one time if for no other reason than my great-grandmother, the Bertha Hepps of the “In Memory of Bertha Hepps” square, died in 1957. And yet, her square is right between her husband’s (d. 1949) and her brother-in-law’s (d. 1948), so they must have reserved her spot. Other squares were added later, too: “In Memory of E.A. Keizler” could have been added no earlier than 1960, “In Memory of Sylvia Freed” 1970, the Moss memorial squares 1970 and 1971, and so on. Presumably five other napkins besides those I can obviously identify were also later additions; if you look closely, there are a few different embroidery styles going on, which fits. Besides these memorial squares, there are a number of squares noting the contributions of families then active in the shul. I enjoy seeing the names of some of you who are readers of this site today! Who dumped food on the Weinberger & Gross families?! Because the sisterhood minute book ends in early ’56 it’s unclear when the cloth was used, although they mandated that its use be confined to “formal affairs of Sisterhood + Cong held in the Schule.” I suspect it was first used to cover the speaker table at the banquet commemorating the 50th anniversary of the sisterhood on December 11, 1955. Judging by the residual food stains, it performed its function well over the years. 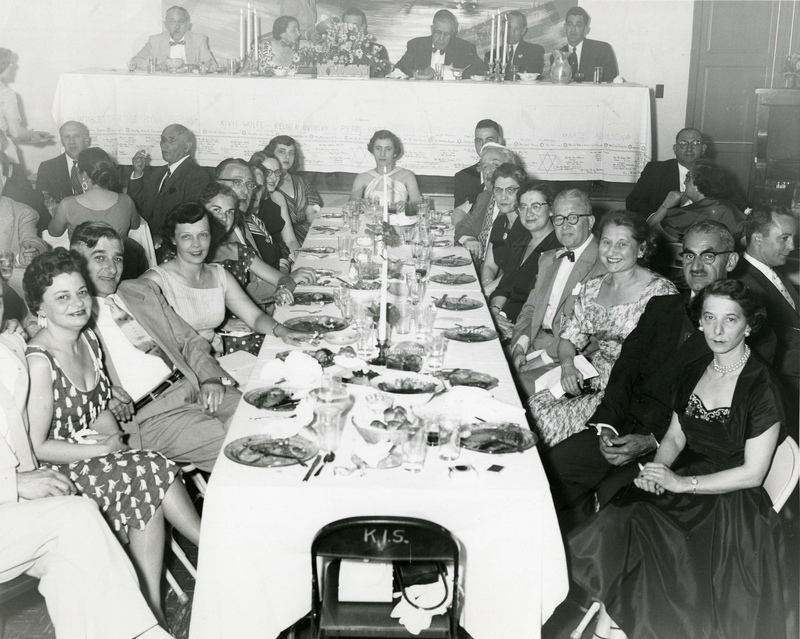 At the end of 1955 Mrs. Harry Weinberg reported that the tablecloth cost $149.56. They collected $983.56 for it, which gave them a $834 profit. Like most of Sisterhood’s profits over the years, what they didn’t need for their own expenses they donated to the shul for its operating budget. 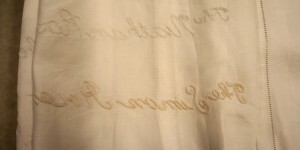 More than merely honoring the families whose names are embroidered on it, the tablecloth stands as a unique symbol of the women’s tireless work over many decades to support their beloved community. 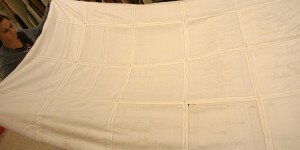 The left side of the tablecloth unfolded. The right side of the tablecloth unfolded. The reverse of the Rosenthal square. 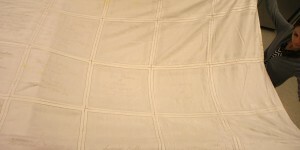 Source: 93.89.1–Tablecloth. Courtesy of the Senator John Heinz History Center. I remember this project. 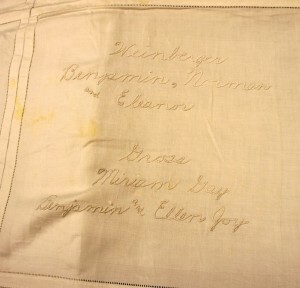 My mother was Mrs. Harry Weinberger…I remember the the “napkins” and seeing them in a box in our house. Hazel Weinberger was my grandmother (Harry’s wife) and I just love this story, seeing her name in print, and learning about this wonderful project. I’d love a picture of the Weinberger square (Norman is my Dad). Thanks for sharing and long live the wonderful ladies of Sisterhood who do so much to sew our history together and infuse our synagogues with support and love. I am also a granddaughter of Mrs. Harry Weinberger (Eleanor is my mother). Thank you for sharing this wonderful piece of our family’s history and reminding us how important Sisterhood’s are for our communities’ histories. What a special piece of history!